NEW BRITAIN – By the time Erin Stewart was born in 1987, Antonina “Ann” Uccello had been out of the public eye for more than a decade. the nation’s first female mayor of a capital city and later served as one of the highest-ranking women in the Nixon administration. As Stewart set a course for public office and sharpened her political skills, she heard Uccello’s name invoked on more than one occasion. “Once I became mayor in 2013, a lot of people were drawing the correlation between us,” said Stewart, whose appreciation for Uccello’s career piqued last year with the publication of Paul Pirrotta’s biography of the former mayor. In social media posts, Stewart lauded the book and proclaimed her wish to meet Uccello. The New Britain mayor was able to check the encounter off her bucket list on July 6. 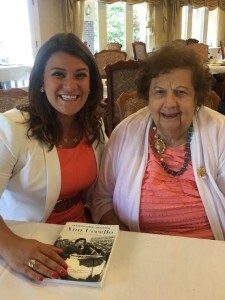 Thanks to a mutual friend, she spent three hours at the Brookdale Chatfield senior complex in West Hartford in lively conversation with the former Hartford chief executive, who turned 94 in May. The two discussed contemporary and vintage politics, the challenges of leading and promoting cities with inherent troubles and the tribulations Uccello faced as a woman navigating the waters of City Hall in the “Mad Men” era. Uccello’s ascension in 1967 from the Hartford City Council to the mayor’s office – by 170 votes – landed her on the state political stage. Stewart pointed out that Uccello was a prominent figure even before her predecessor’s name was removed from the letterhead not only due to her gender, but because she was the first Republican since 1948 elected mayor. Forty-five years after leaving Hartford for a post in Washington, D.C., Uccello remains the most recent Republican to hold the office. In 1971, Uccello was appointed the director of the newly-created federal Office of Consumer Affairs in the Department of Transportation. She returned to Connecticut in 1979 and never again sought public office. Among the numerous honors she has been bestowed, Uccello was inducted into the Connecticut Women’s Hall of Fame in 1999 and in 2008 had a street named for her in downtown Hartford. This story originally appeared in the New Britain Herald. Christopher Fortier can be reached at 860-801-5063 or cfortier@newbritainherald.com.